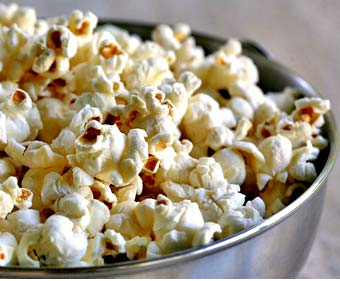 Homemade popcorn’s been a Shabbos afternoon staple around here for years because it’s yummy, healthy, easy and cheap. Inevitably when I serve it to our Shabbos guests, someone always remarks with wonder that I made it in a pot. I promise you, it’s easier than making noodles, and once you make it, you’ll never return to the microwave or store-bought option. But it wasn’t until recently that I actually read a recipe for making perfect popcorn every time. Popcorn just got better. And if you’re really up for a treat, try Coconut Curry Caramel Corn from Peas and Thank You. **Fair warning: you might eat the whole bowl by yourself. Heat the oil on high in a large pot (a non-stick pot works significantly better) with only 3 kernels in it. Once the kernels pop, add the rest. Shake the pot over the flame to soak the kernels in the oil and then shake a few more times as it pops. Continue popping until it slows down to more than a second between pops. Add salt and shake the pot more. Wendy, do you really use 1/4 cup oil? That sounds like a lot. But I bet it tastes so good! I don’t have much luck doing it in the pot maybe because I’m not using enough oil… I usually airpop and spray with an olive oil filled Misto and then sprinkle with popcorn salt. We can go through about 4-5 batches a week.